YoYoExpert Blog & Yo-Yo News – New Core Co Alleycat 650b & Response Pads Restock! New Core Co Alleycat 650b & Response Pads Restock! The idea of the 650b was to go more towards the fixie analog side of things. One major complaint they received is that the original alleycat didn’t shoot the moon very well. The 650b reduces diameter by 2 mm and increases centerweight a good bit to help with responsive tricks. They also closed the gap just smidge on the 650b to give it a really satisfying feel when it returns to the hand. Visually, it has been softened too. The edges on the 650b are smoothed out and the hex tool hub has been removed. Finished with a matte blast and no graphics, the Alleycat 650b has a really great feel and clean look! These pads are compatible with most yo-yos that use the small bearing Standard Friction Sticker size pads (12mm inner diameter). 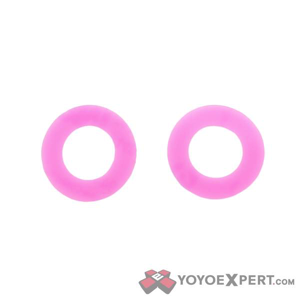 They are made from long lasting silicone and available in a vibrant pink color! CORE CO RESPONSE AVAILABLE HERE!